Neil Young is supporting the campaign to pardon the Indian activist Leonard Peltier in his latest Facebook post. "For over forty years Mr. Peltier’s case has retained the support of your fellow Nobel Laureates including Archbishop Desmond Tutu, Jody Williams, Rigoberto Mencu Tum, Adolfo Perez, Esquivel Mairead Maguire, Shirin Ebadi Tawakkol Karman and the Dail Lama, as well as religious and human rights leaders from around the world including, Coretta Scott King, the Robert F. Kennedy Memorial Center for Human Rights, the Rev. Jesse Jackson, the National Council of Churches, dozens of members of Congress, political leaders of Canada, and before his death, Nelson Mandela. In addition the National Congress for American Indians, Amnesty International, and former United Nations Rapporteur James Anaya all recognize and stress the historic importance of this case throughout Indian Country, and continue to support Clemency for Mr. Peltier as an essential reconciliatory action. We respectfully submit that the very fact that for over 40 years so many activists, human rights leaders and Native communities remain committed to seeking reconciliatory action for Leonard Peltier, is itself compelling proof that there was a miscarriage of justice which requires thoughtful review and equitable resolution, taking into account the time already served. The supporters of this Petition include scholars and human rights experts who serve an essential function in our democracy; they operate as watchdogs and raise their voices in those rare instances like this, where there is a need for the Government to examine and re-evaluate its conduct, because even with the best of intentions, we are all human." 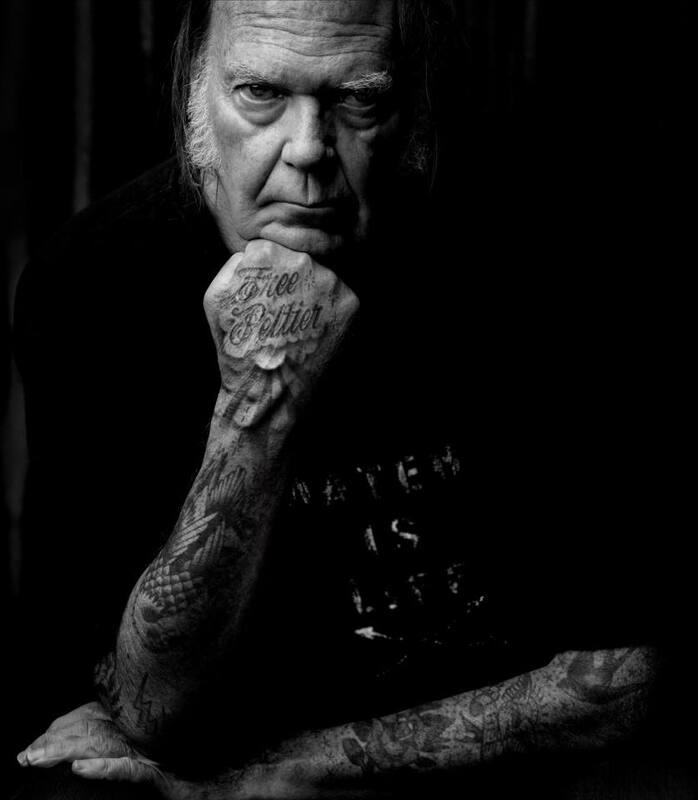 Neil Young's tattoo in the photo are apparently "fake" -- as in photo-shopped. The photo is by Cheyenne Randall The Amplifier Foundation. "Randall explores the identity of iconic individuals from yesterday and today, Randall blends traditional American tattoo culture with some of history’s most celebrated Pop Icons. His 'Shopped Tattoo' series calls to question the modern obsession with fame and glamor as well as the stigmas surrounding body modification in today’s societies. Using his mastery of photo manipulation, Randall immerses his viewers in a parallel universe." So why does Neil Young Still Sing Truth To Power? How many Neil songs have been written about the plight of the Native American? Is he getting on the band wagon here? Try James McMurtry 'Choctaw Bingo'. @Andy Walters--I feel it should be said that Neil has been writing sympathetic songs about Native Americans for sometime: Cortez, Pocahontas, Hitchhiker/Like an Inca, Inca Queen, Goin' Home, Peaceful Valley Blvd. If there's a bandwagon, Neil might have been one of the first, just to be fair. Good reminders Ian. And there are probably a few more as well. Neil has definitely been a Marlon brando on the subject.